We’ve all listened to the Modesto Chamber of Commerce tell their story, some of us six or seven times, of how their Transportation Committee met over a six month period (it gets longer every time they tell it) met to discuss Modesto’s land expansionist planning needs for the next twenty years. In previous articles we chronicled how the Chamber went from needing 1,000 acres to over 25,300 of land during their series of presentations to various civic groups and public entities. The above map is from their July 2013 presentation. This represents their goals and is an early view of what the comprehensive General Plan scheduled to begin two years from now will look like if they get their way. As usual when it comes to people attempting to manipulate the public for their own selfish interests what they don’t tell us is just as, and sometimes more important, than the information they disseminate. 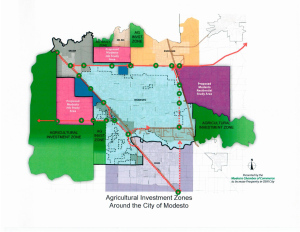 For example during these ‘planning meetings’ that Mayor Marsh and City Manager Nyhoff attended along with members of the Chamber’s Transportation Committee, they discussed how best to seize Wood Colony land for an industrial park and sneak Salida’s already zoned business park land from them to be placed under Modesto’s control. I admit after hearing Mayor Marsh paint George Petrulakis and the Chamber as ‘evil’ and a position we don’t totally disagree with, as the people we really had to worry about compared to himself and his friends, I was surprised to learn of the initial collaborations. When his friends, Councilwoman Kenoyer of (I don’t have to worry about Wood Colony because they can’t vote for me) fame, and Councilman Gunderson who just can’t stop repeating “no one is talking about annexation”, while the Mayor keeps using the terms annexation and eminent domain, don’t make anyone feel they can be trusted. Part of the ‘art of the deal’ was the watering down and delay of Denny Jackman’s Residential Urban Limits proposal. An arrangement was made so the Chamber wouldn’t fight it when it came on the ballot but at the council meeting where it was proposed, a little ‘kicker’ was added. Councilman Cogdill proposed that Modesto would repeal the Measures A and M which deal with the public’s ability to control land acquisition and development(sewer expansion) by the city by requiring public advisory votes. All of the General Plan Amendment discussion has been orchestrated from the beginning by just a few people. For example the rank and file of the Modesto Chamber of Commerce don’t get to vote on the Board of Directors, they’re appointed, the same is true of the Alliance. The Modesto Planning Commission and Staff spent the better part of a year holding workshops for the public where Bill Zoslocki and Craig Lewis passionately advocated for a much larger footprint for Modesto. People came forward and expressed themselves very succinctly. And the Planning Commission’s meetings, Brent Sinclair and the rest of Modesto’s planning staff listened to the public’s wishes and proposed a footprint which was in line with Denny’s original RUL proposal. Then the politicians stepped in. For a while you needed a score card to understand where each one of them stood. From Nyhoff’s open mic fiasco where he dissed everyone who disagreed with the Chamber, we learned why Jenny turned her back on both her campaign promises, to protect prime farmland and keep Salida for Salida. The bumbling John Gunderson, so elated the Mayor was finally talking to him as an equal, rubber stamped every proposal Marsh made whether he understood them or not. For Cogdill and Zoslocki the mantra is “more is better.” But Zoslocki added “but I can’t be caught voting/going on the record for it.” Lopez, after being warned about people willing to energetically campaign against him in the Board of Supervisors race, disavowed any interest in Wood Colony. And Madrigal, well Tony is still out collecting prom dresses, rather than focusing on the larger tasks needed by the city. But it all began with a few greedy real estate men (Zoslocki and Lewis), a small handpicked few from the Chamber, a City Manager who spent more time working for the desires of a few in the Chamber of Commerce than he did the people of Modesto, and a Mayor who though he could write his own legacy by stealing the land from the residents of Salida, the farmers of Wood Colony and the German Baptist Brethren who, to take a page from Jenny Kenoyer’s book, don’t vote anyway. And We, the Citizens of Modesto are the only ones who can stop this. And what have we been doing? We’ve been saying…. Sir, can I please have another? It’s time to take back our City Government from the greedy special interests that are intent on ruining Modesto.